Pathfork filly beats the boys! 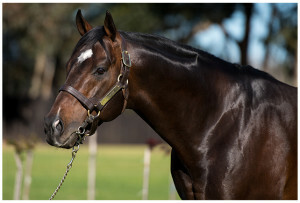 Highlands Stud part of Ridgemont’s G1 winning sire Pathfork continues to enjoy great success this season, with his two-year-olds in particular firing on all cylinders. Pathfork was responsible for yet another stakes winning two-year-old when his talented daughter Madame Speaker beat colts and geldings to win the Listed East Cape Nursery at Fairview on Friday. The Alan Greeff trained filly was steered by jockey Teaque Gould to a 1.5 length score, as favourite, in Friday’s 1200m contest. Now a winner of two of her four outings, Madame Speaker had previously finished second in the Listed East Cape Fillies Nursery. Produced by the National Assembly mare Word Perfect, Madame Speaker was a bargain R25 000 buy from the 2017 National 2YO Sale. She is one of five two-year-old winners for Irish Champion 2YO Pathfork this season, with other notable juvenile runners for the sire including impressive debut winner and G2 SA Nursery entrant Mr Flood. Another smart looking 2yo representing Pathfork this season is Go The Distance, who has been entered for the Listed Perfect Promise Sprint at Kenilworth on Sunday May 6th. Pathfork, himself winner of the G1 National Stakes at two, is no stranger, however, to siring high class juveniles, with his previous notable two-year-olds including six and a quarter length G3 Godolphin Barb Stakes winner Red Chesnut Road, Dahlia Plate second Turbo, and Listed East Cape Fillies Nursery winner (on debut!) Precious Pansy. The son of Distorted Humor had yearlings fetch up to R425 000 at last week’s Emperors Palace National Yearling Sale.